For more than 60 years, Huston Smith passionately studied the world’s religions. He has participated in sweat lodges and other ceremonies, lived in a Zen monastery, maintained a 25-year practice of saying Muslim prayers five times a day and a 50-year practice of reading daily from the world’s scriptures before breakfast. Always, he has combined a great intellect and the exuberance of one who has not gotten over his first amazement at the world. 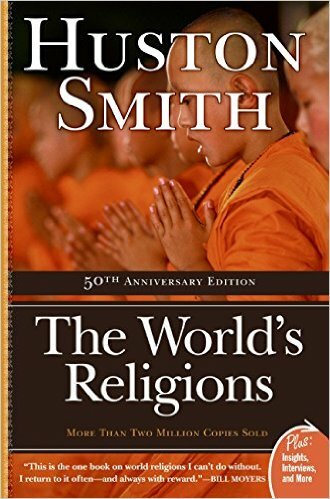 Teacher, writer, videographer, and producer, Smith is best known for his perennial best-selling book, Religions of the World, which was first published in 1958 as Religions of Man. Huston died at the age of 97 in 2017. His obituary in the New York Times highlights his life. What have you noticed happening in the world of work and spirituality? Prior to industrialization, work was meaningful. People saw the connection between their efforts and the finished product, whether they were growing rice in the fields or weaving a carpet. With industrial mergers, more and more workers are not their own bosses. They are paid piecework rates. They neither see nor sense the importance of what they do to their communities. Work is no longer centered in the home or homestead. People go off to work and return with a paycheck. Work is disassociated from the rhythm and continuity of family members. Traditionally children learned crafts from their parents. The bonding in the course of that learning was psychologically nurturing. Now father leaves his home and son has no contact with his father’s work. Increasingly that is true for mothers and daughters, too. Many are rather ashamed of their work because it lacks dignity, leaving little room for creativity on the part of the worker. They are told what to do. They do it all too much as if they are robots. Have you noticed a change in people’s attitudes and practices in relationship to work? Sleep research experts show that we are tired a good portion of the time. Many mothers take care of the children and the household functions on top of an 8-hour job. That is like two full-time jobs. How have you seen people respond to the changes in work? People are overworked and I don’t think we like it. Some people love their work and throw themselves into it. I am emphatically one of them. There is nothing I enjoy more than work, except relationships with family and taking the dogs for a walk and composting. Those are great pleasures. Other than that, there is no line between work and play because I like to create and my work gives me ample time for that. But I am one of the fortunate. For the overwhelming majority, work is not gratifying because it is not in a supportive context of intimate human relationships and provides too little room for initiative and imagination and sense of accomplishment. I fear things will get worse with the mergers. Workers used to be able to accumulate equity. If they earned $10 an hour — which meant more than it does now — they could anticipate buying a house, having vacations and a retirement pension. But those built-in equities are being withdrawn. The chief point of mergers is to replace full-time workers who have security in the job with part-time workers who have no medical benefits, no vacation, no retirement, and no security against being arbitrarily laid off. This is a frightening prospect for most workers. I do not understand economics and my view may be too pessimistic, but I have economist friends, and they are concerned, too. It is an undeniable fact that the rich are getting richer, the poor, poorer. The gulf between them is widening. Have you paid much attention to the spirituality and work movement? I came across a statistic that 70% of CEO’s pray over their important decisions. It seems plausible that there is a greater effort to introduce spirituality into the work situation. You have directed your life’s work to eight of the world’s wisdom traditions. You concede that not everything in them is wise, but they have great resources. What does each of the traditions have to say about spirituality and work? Shall I take you on a quick Cook’s tour of the eight and single out one point in each that seems to speak directly to this issue? Buddhism: I want to separate Southern (Theravada) Buddhism from the Northern (Mayahana) branch. Theravada society is divided into three segments — the government, the laity and the monks. The work of the monks, like monastics in the west, is to cultivate the spirit and to let its resources help the laity. They work very hard. They get up very early and pray, but it is different from the work of the laity who support them. Many in the secular world often think monastics don’t work, that monks are freeloaders because society supports them. Their work is actually the most important, but it is not making furniture, not building houses, not secular work. In Mayahana, there is a saying in Zen that “one day of no working is one day of no eating.” Meaning, unlike the Theravadans, they try not to be beholden to society. When I spent my time in a Zen monastery I spent as much time in the vegetable garden as in Zazen or meditation. Taoism and Confucianism: China has had a marginal economy from its start, because only 14% of the land is cultivatable. 80% of the people throughout the ages were illiterate. They work very hard from dawn to dark to wring a living from the land. I have seen scholars with fingernails 8 inches long on the left hand. Their left arm was paralyzed from keeping it held up, out of the way. This seems awful to me, but in traditional China that was a prestige factor because it signified that they were scholars and didn’t have to engage in manual labor. Their right hand was free for calligraphy, writing poetry. This is a dark side where manual labor was looked down upon as demeaning. It wasn’t all dark. In Confucianism, there was a very strong counsel to tend to one’s parents. People looked forward to aging as they don’t in this society. As you aged, there were two things you could be sure would happen: First, you would be served more with every advancing year. If the teapot needed filling, the younger generations would jump to do it. Second, the older you were, the more your opinion was valued. It was like being on an escalator carrying you automatically up in being served and valued. Judaism: No people work harder than Jews, but they punctuate their work with a day of rest. Even God rested on the seventh day! What would it be like if he had gotten through the sixth day and said, “This is good stuff!” and kept on going? We would have a surfeit of stuff. If we are made in the image of God, we should follow his example. He knew enough to stop. We’re not smart enough to stop. We just kept on going and going. I grew up on the mission field in China and there was no work on Sundays. Orthodox Jews carry out that to a great extreme — you shouldn’t even light a fire for cooking on the Shabbat. But as a countermand to all that work, work, work, never stopping, I think it is very wise. I have to confess I have not honored the day of rest since I left home. If there was one specific I could change, if I could live my life over, I would honor the Lord by keeping Sundays holy for rest — holy and wholly tightly joined. Christianity: I think of work as a vocation, meaning a calling (that is the literal meaning of vocation). But how many people work as if their work is a calling rather than just something they have to do in order to take the milk pail home in order to survive? The term of vocation is a very spiritual concept. Tribal peoples: They have no writing and they are very close to the earth. We think of them as having to work very hard to find their berries and hunt. But according to anthropologist Marshall Sahlins at the University of Chicago who has written Stone Age Economics, the reverse is true. Rather than being ground to the bone, most tribal peoples spend five hours a day doing the things they need for life. The rest of the time is for gossip and daytime sleep. They live the Buddhist concept of ease of being: they infold work in a social context with other people. They don’t increase their demands beyond their needs. The phrase “want not, lack not” points up how much of our lives are spent in working ourselves to the bone to get what we don’t really need: conspicuous consumption, a status factor to have a shiny new car when a modest one will do, and the same for our houses. The tribal peoples keep their needs minimal so they don’t have to pour as much of this short life into accumulating things. This interview with Huston Smith was originally published in Spirit At Work Newsletter. Copyright by Pat Sullivan, July 1998. All rights reserved. For permission to reprint, write pat@visionary-resources.com. Pat Sullivan is the author of Work with Meaning, Work with Joy (Sheed & Ward) and of 26 columns on spirit at work that were published in the San Francisco Chronicle. She speaks and consults on spirit and work. You can reach her at (510)-530-0284 or Pat@visionary-resources.com. Her new website is www.everydaygenius.info.